Want to show the world how much a geek you are? Being able to read this? Well, it's 'just' a binary clock, but I am sure, most people will shake their heads when you can tell the time from this. OK, there is a way to cheat a bit. As shown in the picture above, when you press the berry button, it will tell you (a bit) how to do it by overlaying the white numbers. Upper left dot enabled is pm, top row from right to left: 1,2,4, 8 - all enabled dots to be summed up for the current hour, middle row for the minutes and bottom one for the seconds. 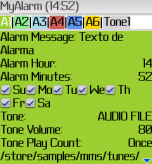 This app allows you to setup up to 6 separate MP3 or MIDI alarms on your BlackBerry. It is more useful than the one Blackberrys comes with. Provides lots of options.